Kansas City is known for its beautiful parks with sprawling spaces with everything from swings and slides to hiking trails, lakes and places to picnic. Here are the top 10 parks in the Kansas City Metro—so get out and go. Shawnee Mission Park is not only one of the biggest parks in Johnson County, but it's also the most visited in the whole state. With a whopping 1,250 acres—SMP has everything that makes a park great with beautiful trails, shimmering lake, native wildlife, camping grounds and nice facilities. Hike the Mill Creek Streamway Trail (11 miles in total) which is great for old and young alike. Something Cool: Shawnee Mission Park has one of the greatest leash-free dog parks anywhere! Kids love Antioch Park's Old Dodge Town playground which houses a pint-sized hotel and general store just like those in the Wild West. There's also a cool playground and a lake in the park with dozens of shelter areas for picnics and barbeques. Location: 66th Street and Antioch Road in Merriam, KS. Penguin Park is the place for kids—and the city Parks and Rec's department have done a great job of revamping it over the past few years. With huge slides and a 20+ foot Penguin, kids don't want to leave this famed Northland park. They've also got a great trail that leads down to the lake on the south side of the park with plenty of shelter houses and bbq grills to go around. Something Cool: Check out the 26-foot Kangaroo slide that has been a fave of kids for decades. 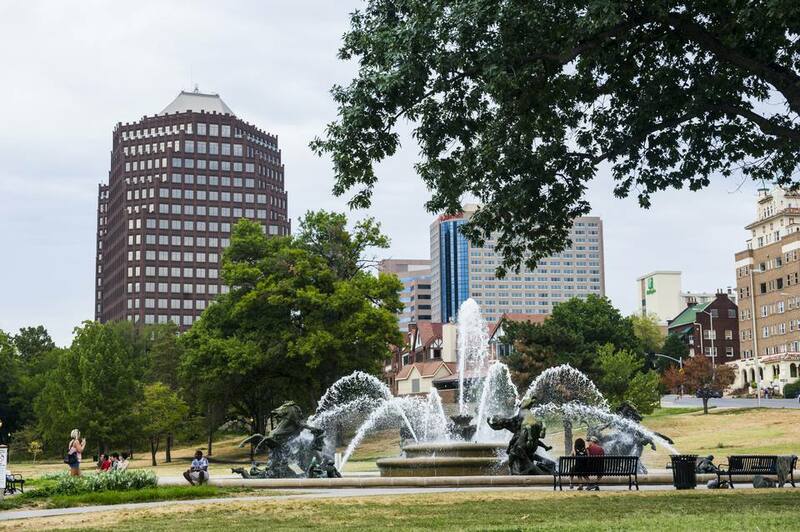 Located just South of the Country Club Plaza—Loose Park is touted as one of Kansas City's favorite gems. With its beautiful rose garden, state-of-the-art playground, walking trail, and the famous Loose Park Pond—it's the perfect place to take the family or enjoy a picnic. You can feed the birds, take your dog and make a day of it. Something to Look For: Check out the Civil War Marker at the South side of the park. With everything from five playgrounds, six open play areas, a ​beautiful lake and even a skate park, Sar-ko-Par is a great place to let the kids run free. It's also great for families with plenty of shelter areas, basketball and even sand volleyball courts. Sar-Ko-Par has a little bit of something for everyone! Location: 87th Street and Lackman Road. Don't Miss: The Legler Barn, railroad museum and restored BN Railroad Caboose. McCoy Park is located in historic Independence and lies just across from the Harry S. Truman Library. McCoy has it all with playgrounds and spray grounds, shelters and tennis courts. It also has a bunch of picnic shelters which are perfect for taking a lunch break. English Landing Park is located just to the south of downtown historic Parkville. This sprawling park is right next to the banks of the mighty Mo—and has a great walking trail that runs right along the river. English Landing also boasts a bunch of swings, a large playground, soccer field and lots of other amenities. Don't forget to visit the Farmers' Market on Saturday mornings. Kids Will Love: Watching the trains whiz by on the oh so close train tracks! The Overland Park Community Park has been a fave of metro families for decades. The park has over 177 acres in which to play and houses a huge playground, shelter houses, and picnic tables—as well as a number of softball and soccer fields, tennis and volleyball courts, and even has its own skate park. The OP Community Park even has a nice walking trail for all to enjoy. Don't Miss: The Deanna Rose Children's Farmstead, located right next door. Macken Park, recently renovated by NKC's Parks and Rec department and the city council has undergone a major transformation in the last few years. Macken has a brand new playground and a great tennis facility for all to use. Check out the great walking trail which is great for mom's with strollers, walkers, and runners and it also has great places to picnic. The huge trees provide great shade for those hot KC summers. Fleming Park is by far Jackson County's largest public park with a sprawling 7,800 acres of outdoors to enjoy. The park houses Lake Jacomo and Blue Springs Lake which both have fun water-themed things to enjoy. Lay out on one of their great swimming beaches or catch a fish on one of the banks, go sailing or rent a boat for the day. Fleming Park also houses historic Missouri Town 1855, the Burroughs Audubon Library and the Native Hoofed Animal Enclosure which offers up safari-like tours of native wildlife.